To eat again at The Barracks Inn is to take a page from my childhood and add notes to the bottom. Slung low along the Sackets Harbor shoreline, this legendary eatery has been given new life this season by a former employee of the Coleman restaurant empire. It’s clean, freshened up, and ready to serve as the backdrop of an idyllic evening of your summer. We brought two of our favorite young people with us to dinner, Joelle and Troy, in order to pass the rite of The Barracks on to the next generation. Now they, too, understand the casual splendor of dinnertime passed looking out that wall of windows at glittering, sunset-hued Lake Ontario. 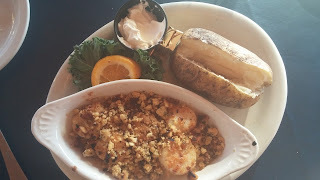 Maria, our young waitress, could not have known the expectations we carried with us to our table in the medium-toned wood and navy, nautical themed dining room. This place has been a family favorite for going on 40 years, and after a hiatus filled with longing, we were pumped to have The Barracks back. To Maria, we probably just seemed hungry. Shrimp cocktail ($10) amounted to four jumbo crustaceans cooked perfectly. They were tender, cool, and just cooked through, plump and sweet. The cocktail sauce with which they were served was pretty basic, so the shrimp were the star here. 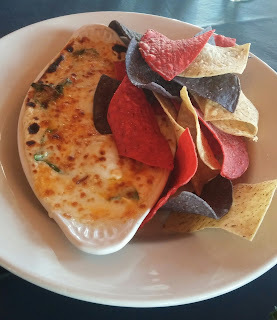 Everything dip ($11) was creamy and mild; my first bite more cheesy than anything else. Upon a more vigorous ingredient hunt with my second tortilla chip, I tasted the metallic brightness of fresh spinach, the soft richness of crab, and the faint lemony flavor of minced artichoke hearts. 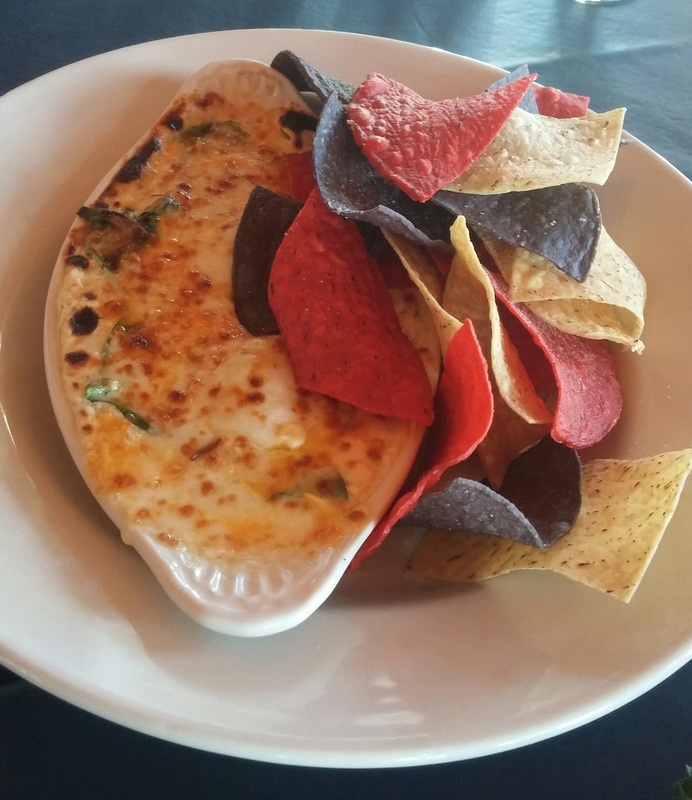 In my opinion, this hearty dish could have used about two good shakes of hot sauce just to break up all the creamy dairy, but three of our five diners adored it as is, and couldn’t shovel up scoops of the gooey dip fast enough. 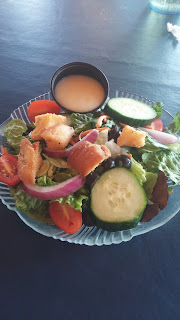 Our salad course brought bowls chock full of crunchy, fresh spring mix, cucumbers, grape tomatoes, carrot shreds, black olives, and croutons that actually didn’t shatter when you tried to spear them with a fork. 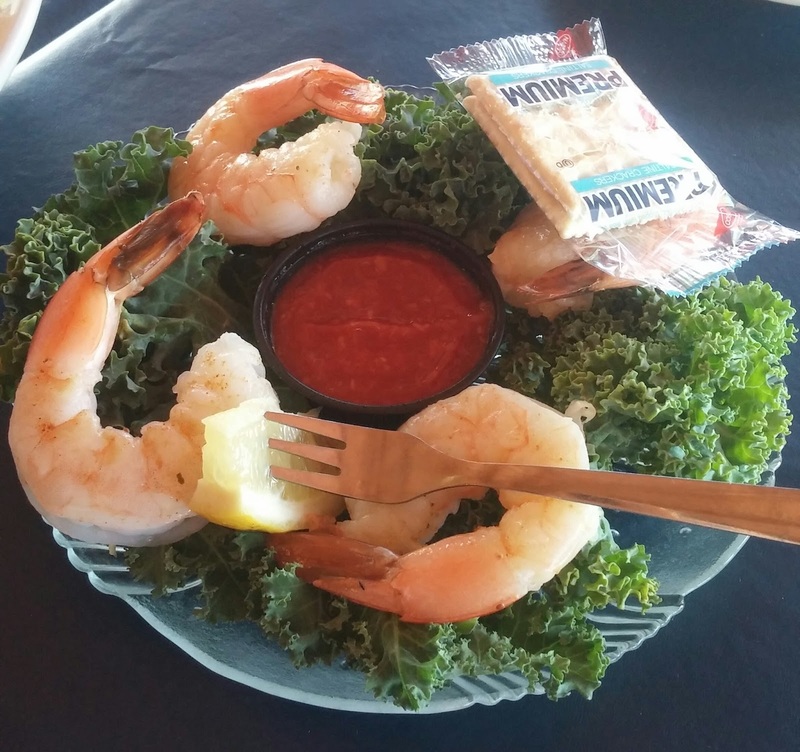 Best of all, The Barracks has the same house Italian dressing they serve at Fairgrounds Inn, in Watertown – the recipe possibly a parting gift for the owner? If you haven’t had it, the dressing is one part vinaigrette, one part mayonnaise, one part sugar, and completely delicious – tart and sweet. Chicken penne pasta ($16) was well-seasoned, with tender chunks of white meat chicken and al dente pasta swimming in a creamy, but not heavy sauce. It was garlicky, and the fresh spinach and roasted red peppers added to the sharp, popping flavors. The diner who ordered it devoured every bite. Smoked turkey BLT ($9) arrived on a ciabatta roll the size of a life raft. The deli meat was thinly sliced and fully flavored, its smoky notes echoed in the thick-sliced bacon, and balanced with sweet, ripe tomatoes. 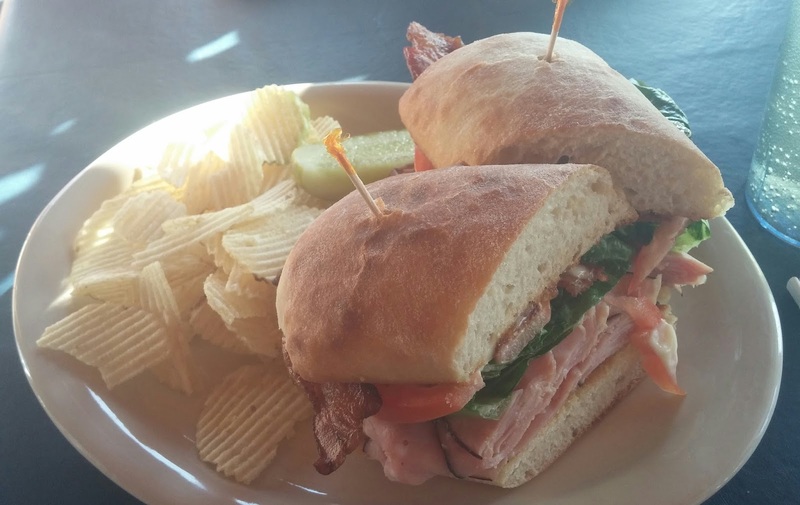 That life raft – er, ciabatta roll, was soft and supremely chewy. The pickle spear served alongside was nice and crunchy, not limp or flabby like so many afterthought garnishes. 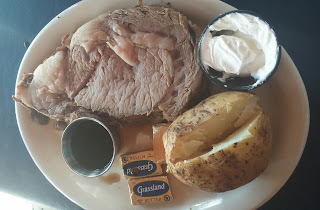 Prime rib ($21) was served with a particularly good tiny cup of au jus. Had it been my dinner, I would have asked for a big cup, and then stolen all the rolls to dunk in this garlicky, beefy elixir that somehow avoided being salty – the end point for so many of its kind. The generous slab of roast beef was cooked to order (medium, in this case), a little chewier than I’d prefer, but my guess is that that was due to being cooked further than I would order rather than any flaw with the meat. The flavor was pretty unimpeachable. 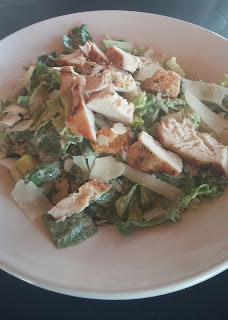 Chicken Caesar salad ($11) was big, cheesy, crisp, cool and creamy. The chicken breast was grilled, so it leant the dish a hearty, charred taste that worked nicely against that rich parmesan saltiness coating the crunchy romaine lettuce. This is a simple salad, but just plain good. Baked scallops ($19) were cooked perfectly, just like their shellfish cousins in our appetizer. Scallops take on the texture of a pencil eraser when overcooked, but these were delicate and juicy. They also were covered in salty, buttery cracker crumbles, which is a preparation I’ve never had before. 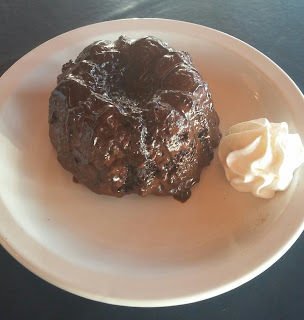 They rendered this into a decadent, kind of naughty dish, perhaps inelegant, but definitely yummy. The baked potato was cooked through, and Maria kindly brought profuse amounts of butter and sour cream in order to check every box I have for a satisfactory starch. Our only letdown came when Maria told us the desserts weren’t made in-house, but came from boxes out of the freezer. I hope our visible disappointment didn’t ruin her evening. 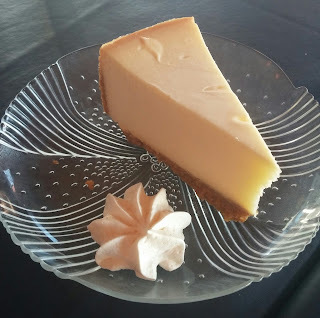 But other than lackluster cheesecake ($6), which had a dense, gelatinous texture more like a dried out pudding pie than cheesecake, we were pleasantly surprised. 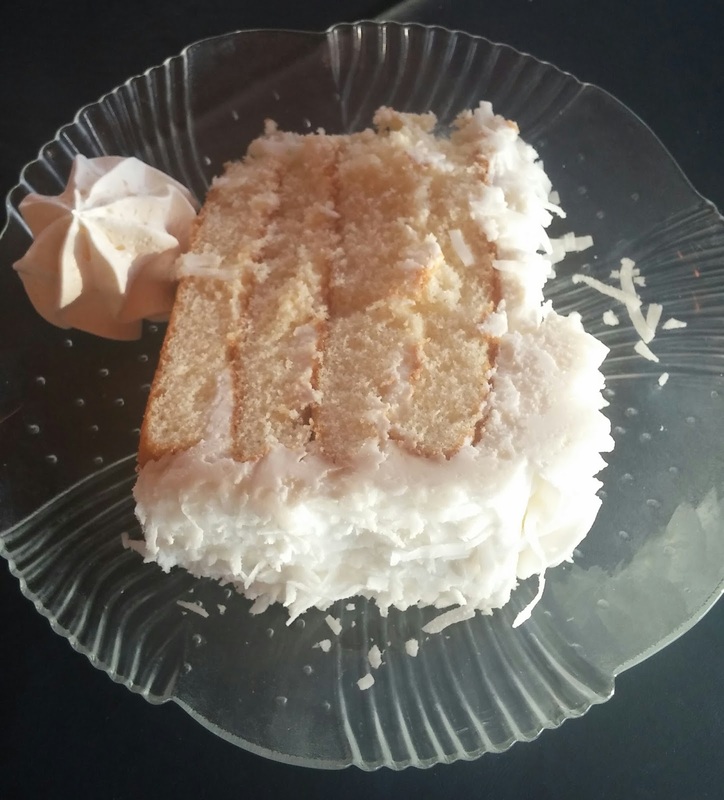 Coconut cake ($6) was moist, with strong coconut and vanilla flavors and an achingly sweet frosting, while the chocolate lava cake ($6) was served warm, with rich, dark chocolate flavor and that gooey pudding-like consistency. Dinner for five, with one cocktail and one glass of white wine, cost us $142.23. The view was free. We enjoyed being among the chatty, relaxed groups in the dining room. Oddly, there were no couples out on date night. Gentlemen of the north country, what are you thinking? Your ladies want to be wined and dined here. Get on it. The waterfront deck isn’t quite finished being set up yet for sunset cocktails, but it’s close. I award The Barracks Inn a seven on the Big Hungry Shelby scale. This Lake Ontario legend is back, folks, and it’s good. 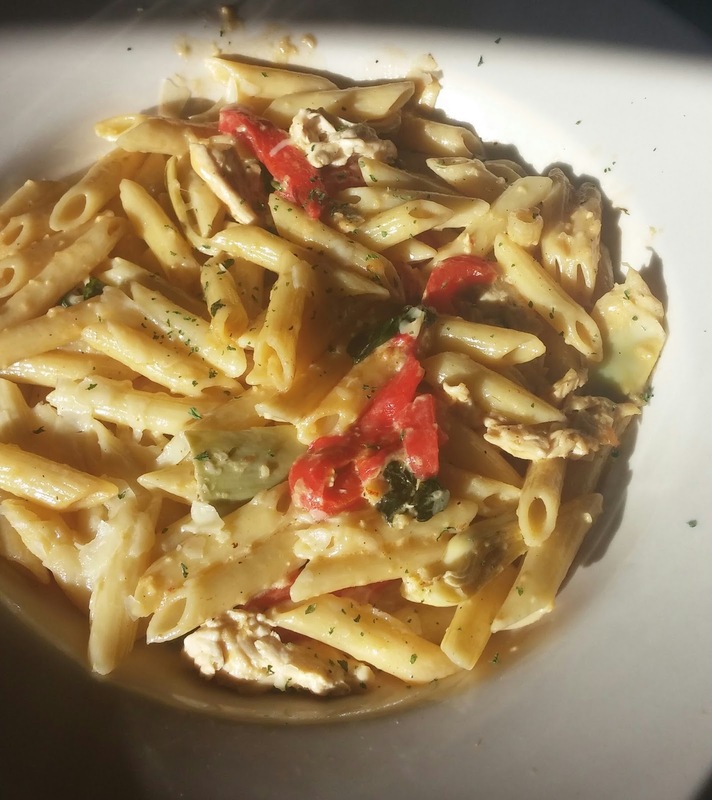 You won’t find fancy, but what you will find is friendly service, a laid-back atmosphere, and the unbridled beauty of Northern New York, plus casual but tasty food. It’s adding a whole new page to my childhood culinary book, and the writing is fabulous.